In a sport full of bad blood, rivalries, and trash talk, respect is often times placed on the back burner. During a week in which UFC Lightweight Champion Khabib Nurmagomedov and former champion Conor McGregor participated in one of the most vicious Twitter exchanges in MMA history, the Russian MMA star took a moment Thursday to express respect for another rival, Tony Ferguson. Last month, concerning news surrounding the former UFC Interim Lightweight Champion Ferguson came to light in a report from MMA Junkie. A TMZ report cited numerous police documents, which contained reports that Ferguson was “acting violent, paranoid and delusional for the past several months.” The TMZ report went on to state Ferguson’s wife had requested a restraining order due to manic episodes. “From what I understood at least, there were some reports about calls to the police, I really don’t want to go into details. Because I myself wouldn’t want to have that sort of attention. “I can only imagine how hard it is for him, especially since it’s about his family. Again, I didn’t follow it closely, just like like you I read some things on the internet. May God give him health and the best of luck. Sport is sport, but family is family. “And let’s hope he’ll return, it’s very strange to see him away, he has an 11-fight win streak in the lightweight division. And now he’s on the sidelines. “I guess that just means that at this moment in time he has to go through this test. Each person faces their own challenge, some people get ill, some people let money go to their heads, some people drink. Someone has ‘star fever. Different people face tests in different ways. Someone had a surgery, someone is a champion who doesn’t have time for training. Nurmagomedov and Ferguson have been booked four times previously, but due to varying issues with both men, the fight has never come to fruition. 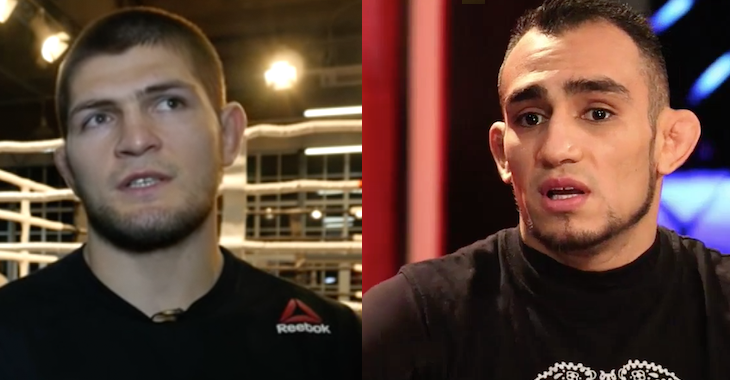 Do you think we’ll ever see Khabib Nurmagomedov and Tony Ferguson fight? This article first appeared on BJPENN.COM on 4/5/2019.